Industrial strength welded carbon steel metal stair treads increase safety and stand up to high foot traffic. Great for use in industrial facilities or outdoor sites where slippery conditions occasionally exist. Helps provide protection against slips in areas prone to oil or other hazardous elements. 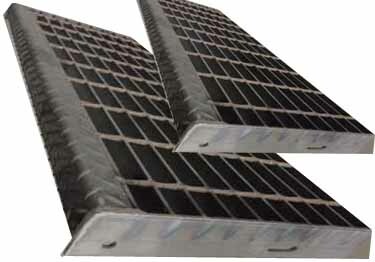 Designed with bar grating stair tread nosing that is attached to the leading edge of the stair tread for increased edge visibility and slip resistance. Checker plated nosing. Treads come available in smooth or serrated and painted Black (strictly a rust inhibitor) or galvanized styles. Sizes: 8-9/16 x 24", 9-3/4" x 24", 9-3/4" x 30", 9-3/4" x 36", 10-15/16" x 30", 10-15/16" x 36", 10-15/16" x 42", 10-15/16" x 48", 12-1/8" x 36"
The Black painted treads are painted a basic shop coat Black as a rust inhibitor, and usually coated again by the customer. Industrial strength welded carbon steel metal stair treads increase safety and stand up to high foot traffic. Great for use in industrial facilities or outdoor sites where slippery conditions occasionally exist. Helps provide protection against slips in areas prone to oil or other hazardous elements.